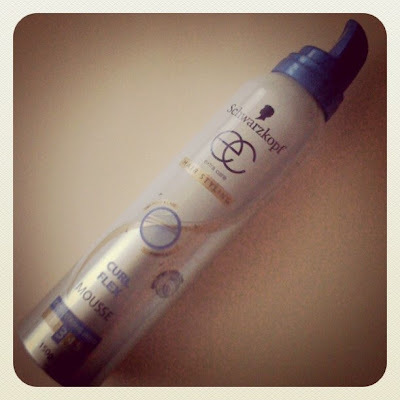 Hi guys, got another review today, this time about Schwarzkopf's Extra Care Hair Styling Curl Flex Mousse. I received this mousse a little while ago for trial and review purposes. I originally wanted to use this to create a curly hairstyle that one of you guys requested, but I haven't found the time yet. I did, however, try it out on my wet hair one night, and slept with my hair still damp. The next morning, I woke up to beautifully defined, piece-y hair. Like the type you see in Britney videos (only a lot less greasy-looking). Since then, I have also tried it on towel-dried hair, twisted up into a bun. The results are gorgeous! My hair has a little bit of natural curl in it (only enough to make it look unshapely and ugly), so I'm always looking for hair products to either eliminate the curl, or enhance it enough so that I don't need to put too much effort into styling my hair (I already spend my time on makeup, I don't want to waste any more time than that!). This mousse defines what little curl I have, and makes my hair actually look bouncy and healthy and shiny. I love it! AND this actually lasts all the way till my next shower! If you have a little bit of natural curl and want to enhance it and give your hair some volume, with minimal effort, this is definitely the product for you.